Posted by Thom on Friday, July 31, 2009 in College Fairs and VU Visiting Your High School, Road Shows, Vanderbilt Blogs. The summer is gear-up time for our office. Plans are being made, flights being booked, and programs being scheduled. 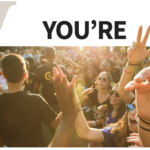 Our biggest tradition in travel is our 2 week, nationwide blitz of admissions receptions called Vanderbilt Roadshows. We hit more than 50 cities in 10 days all across the U.S. These programs are meant to provide the latest details on admissions and financial aid, and start the school-year and travel season off with a bang. They are open to all grades and you can register now. 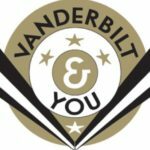 ROADSHOW TRIVIA: Special mentioning in an upcoming post for anyone who can correctly guess what famous musician’s logo was the artistic inspiration for the Vanderbilt Roadshow logo (above). Post guesses in the comments section. Last year, our office recruited students in 45 states and 26 foreign countries. 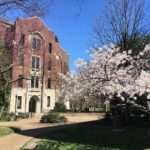 In fact, the BBC, USA Today, and the Chronicle of Higher Education have picked up a story of Vanderbilt’s participation in a college fair geared toward opening the doors to deserving Iraqi students in Baghdad. BlogVU has the complete run down. I’ve been away for a couple weeks and I feel fantastic. 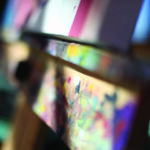 For those of you who read this blog regularly, you know that I don’t usually do much talking about myself. I believe this blog is about you not me. But I want to share a recent joy happening in my life. For the 4 of you who have read my profile you know that I have been trying to finish up a Ph.D. Three weeks ago, I finally did it, and in two weeks, I will graduate from Purdue University with a Doctorate in Educational Psychology. It’s been a dream 7 years in the making. So I offer this as an only marginally better excuse for taking a break from the blog than if I said that I was busy getting caught up on Entourage before watching season 6 episodes (which is also true – so NO SPOILING PLEASE). 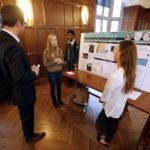 For those of you who might be interested in my research topic, it was a study that attempted to predict how adolescents would cope with the college search by considering their Myers-Briggs personality. We actually found that we could predict how a student would cope with the stress of applying to college by looking at their personality type. I’d be happy to post more on it if people are interested so let me know. I am guessing that the logo is from Bob Dylan’s endless tours. and congrats on your PhD–would be very interested in your Myers-Briggs study regarding college search and personality type. Davidson uses Myers Brigg for roommate selection and I have heard a lot of good feedback on that from students. Probably easier to do in a LAC though. could it be Bob Seger? bob segar and silver bullet band? Definitely Bob Seger and the Silver Bullet Band. I saw them at the Nashville Auditorium around 1983 or so when I was a VU undergraduate.